Corporate deals with U.S. targets flourished in the second quarter of this year, thanks in part to the multi-billion dollar, pending mergers of T-Mobile and Sprint and Marathon Petroleum and Andeavor. Transactions announced during that period grew in both number and aggregate dollar volume. They surpassed totals from both the prior quarter and the same three-month period in 2017, according to Bloomberg data on pending and completed transactions worth at least $100 million. U.S. companies were targeted in 287 announced deals valued at a collective $465.45 billion during the second quarter. It’s the largest dollar volume seen in a single quarter for such deals since the final three months of 2016. That quarter saw 274 transactions — valued at $100 million or more and involving U.S. targets — worth a collective $473.94 billion. The second quarter deal count hit a two-year high, but fell 18 transactions short of the number seen during the same period in 2016. It was a bounce-back quarter for mergers and acquisitions targeting U.S. companies. 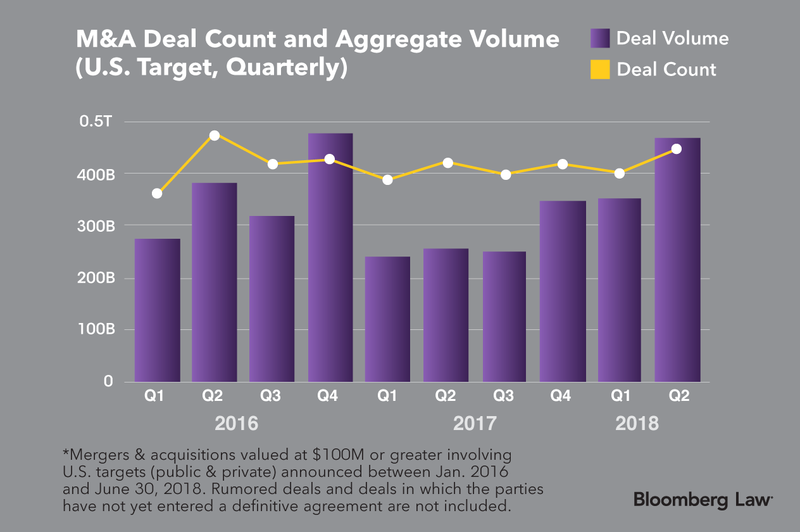 The first three months of 2018 saw a 4 percent dip in deal count from last year’s final quarter, which continued the years-long trend of a spike in deals followed by a decrease the following period. However, total deal volume experienced its third consecutive quarterly increase. It jumped 32 percent from the first quarter of the year, and, according to the Bloomberg data, it was about 83 percent more than the aggregate deal volume in the second quarter of 2017. Mega deals, or those with price tags above $10 billion, dropped from seven in this year’s first quarter to five in the second. That’s the third straight quarter in which the number of mega deals declined. But the total dollar volume of these deals, such as Takeda Pharmaceutical Co. Ltd.'s $80.1 billion pending acquisition of Shire Plc, was $71 billion more than in the previous period. They also made up almost half of the dollar volume for deals announced between April 1 and June 30. T-Mobile’s $57.8 billion combination with Sprint and Marathon’s $30 billion purchase of petroleum refiner Andeavor helped drive up mega deal dollar volume for the quarter. The $231.94 billion of second-quarter, mega deal dollar volume also beat out the $199.5 billion total from the second quarter of 2017.